← UKRAINE: Excuse Me Mister: How Far Is It From Simferopol To Grozny? The authorities have decided to destroy the three main camps, which shelter around 700 people. The only prospect for the inhabitants: a pill against scabies and life in the street! 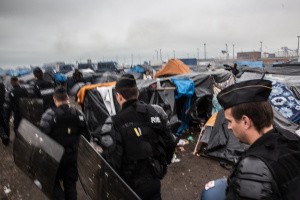 There can be no question of repeating the events of 2009, when the eviction of the Afghan jungle resulted in the arrest of hundreds of migrants, their detainment all over France and attempts to deport them to Afghanistan. There can be no question, after five years of persecution, of starting all over again from zero, while the machine of repression gears up once more. Never again! These refugees from Syria demanded the right to come and go freely, to be treated like human beings, and even if they were not able to cross to England, their struggle resulted, at the very least, in the many tents of the ‘Syrian camp’. Named in reference to this episode, the camp has been able to hold out until now. The police have been forced to harass the camp more discretely, fearing a new wave of radical contestation. It is this ‘Syrian camp’ and those it inspired who are threatened today, but also the camp under the bridge. The Eritreans, who where evicted from their house in mid-October, decided to create a camp below the bell tower of the Town Hall. What courage, to set up camp under Bouchart’s very nose, who had no choice but to see the inhuman consequences of her racist policies. To let these camps be destroyed with impunity would be an insult to the memory of this exemplary struggle, for which some were ready to give their lives. To allow, in silence, a horde of CRS trample these spaces of life, resistance and solidarity, would mean to forget what the Syrians were fighting for, people whom many of us know, who have faces and names, who are resisting and jamming the works of the mechanisms of destruction and dehumanization to which they are subjected. We must pay homage to their courage and their determination. The Syrians have shown us the way, given us insight into the power of resistance and the fear that we are all capable of instilling in our oppressors, taking ground piece by piece. They took the risk at the beginning, demonstrating that they are ready to pay whatever price that respect and dignity might cost. Right now, in the camps, there are migrants of all nationalities, who give life to these spaces of resistance every day. We should fight to hold onto these spaces of struggle, which the authorities want nothing more than to destroy, harass and render invisible until the migrants ask nicely to go home. Only struggle pays off! We call for everyone to come to Calais on the night of the 26th and the morning of the 27th to resist the eviction of the camps! There was a time when we were isolated and powerless in the face of their repression, but now, after five years of struggle, we have all the means necessary to make a network of action. So let’s mobilize in force! Come fight along side the migrants! Posted on May 30, 2014, in Europe and tagged France, Immigrants, Immigrants' Rights, Squatting, Syria. Bookmark the permalink. Leave a comment.